For all of us mountain dwellers who need to have the fresh air and the company of wildlife around us, we need to have the right tires for our mountain bikes. Tires are one of the cheaper but more important parts of the bike and will largely determine the level of grip and performance you get out of your tires. We have decided to put together a list of the 5 best mountain bike tires in 2019. Here you can compare different tires and decide which one has the right features for your riding style. Goodyear doesn’t just help keep cars on the road. They also work to keep you gripped to your favorite mountain path. These tires will fit on rims that are 2″-2.125″ and 26″ rims. This is a basic tread pattern that will give you a good grip on softer surfaces like grass and dirt. The folding bead design helps the tire to stick strongly to the rim and is easy to store if you are using them as a set of spares. They have great value and are a good place to start for beginner mountain bikers. 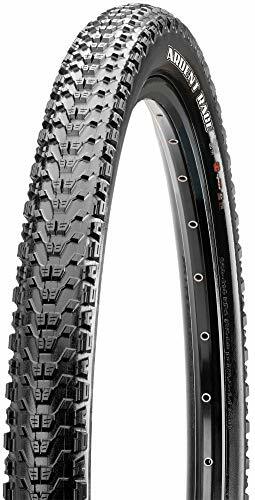 Why we like it – As far as a reliable and durable pair of mountain bike tires go, these ones by Goodyear are all you need to get started. They are not fitted with the latest grip patterns and most advanced rubber, but on softer surfaces, they feel great and grip well to the ground. All-terrain tires are meant for riders who sometimes need to ride the roads to get to the trailhead. 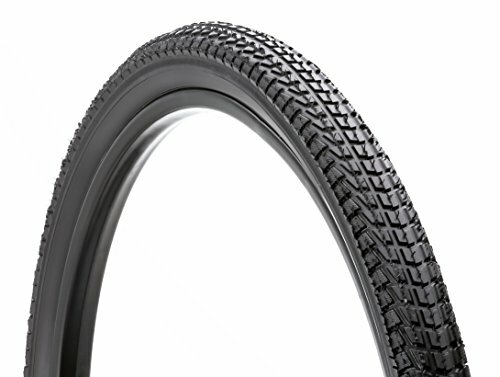 These tires are meant to be ridden on both smoother, harder surfaces, as well as softer, rougher surfaces. You get the versatility of being able to go from pavement to rock pile with great grip and strength. They are meant for bikes with rims at 26’X1.9″. 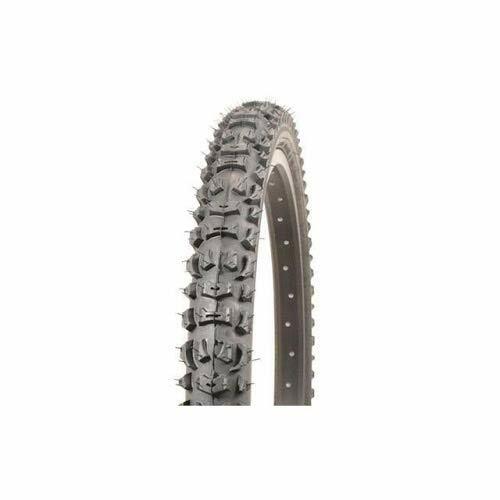 Since they are slightly narrower than some mountain bike tires, they will be suitable for the rider who doesn’t need as much grip but likes to keep the rolling resistance to a minimum. They have a built-in flat-resistant layer to help protect from punctures. Why we like it– The simplicity of being able to go from the road to the trail is really nice. Sometimes riding tires that are strictly meant for the mountain mean that riding on the pavement is often not an option. they still work great on the rougher trails as long as you don’t need a heavy duty style of a mountain bike tire. 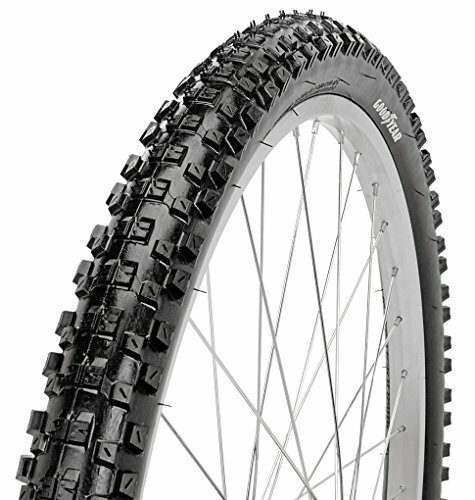 The Maxxis Ardent TR Exo tire is designed to do it all when it comes to trail riding. It is built to have lower roll resistance to give you a lot better momentum on the trail. Very lightweight and adaptable to various trail conditions allow you to stay connected in the sun or the rain. The tubeless setup means that you will have less moving parts to worry about, and the tire becomes highly puncture resistant. The knobby designs are there to help you stay fully gripped to the trail on tight turns and to roll easily on flat terrain. Why we like it – This tire is an all-around dream that gives you confidence on rough trails as well as seamless momentum on smooth trails. The puncture resistance matches that of industry leaders and you won’t find yourself on the side of the road too often. With a tubeless design, you don’t need to worry about buying an extra inner tube to go along with it. This tire will fit onto rims that are 26X2.1 inches. They are beefy when it comes to the treads. They grip perfectly to hard and soft surfaces with no problems at all. When riding up steep hills and descending at maximum velocity, they hold to the ground and give you the confidence you want in order to stay on top of it all. They are really easy to install and have durable sidewall strength. This will help the tire resist bulges and pops when going around harsher corners and hitting heavier trail styles. Why we like it – Whether your climbing, gliding, bombing, you can be confident with these tires beneath you. The look of them alone will make you want to take that tight turn at a higher velocity just because you can. This mountain bike tire is great for easier trails. It is not specifically designed to take on more intricate and daring courses. The tread is more shallow which allows for less rolling resistance. The Kevlar tread center reduces the likelihood of punctures. So if you’re going over surfaces with lots of small rocks, you can be confident that it won’t blow out. This tire measures 26X1.9″. The beading is made of steel to allow it to have a longer lifespan. This is a really comfortable riding tire and any cruiser will be happy to throw it on the rim. Why we like it – Compared to many mountain bike tires, this one gives you the smoothest ride you can ask for. Although it isn’t meant for heavy trail riding, for more smooth trails you get a really nice gliding sensation and a nice and comfortable ride. Mountain bike tires are made different from road bike tires, and that is because they have to deal with an entirely different world of circumstances. Dirt, gravel, mud, water, rocks, and other elements will be coming into contact with your tires and you want to be able to stay within your means all the while. 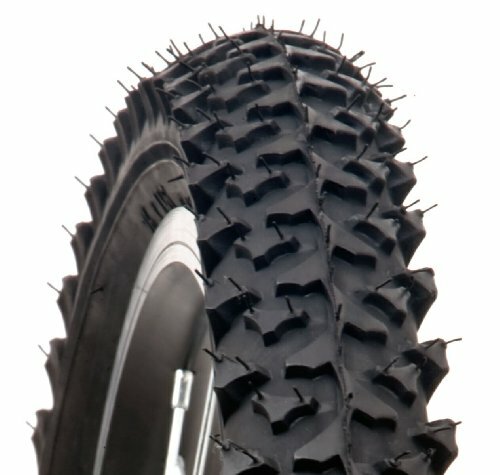 So when you’re buying mountain bike tires, what are some of the things you need to look out for? Mountain bike tires will come in sizes that range from 24 to 29 inches. Be sure that you know what size of tire you need to fit on your rim before going ahead and buying the tires. Mountain bike tires will start at 1.8 inches and go all the way up to 3 inches in extreme cases. 1.2 inches may not seem like a lot, but when it comes to grip and rolling resistance, you will certainly notice it. The wider the tire, the more grip, and stability you will have. For really rough terrain with the loose ground underneath, wider tires can help you stay on top of your bike as opposed to underneath it. Wider tires also mean you will have more contact with the ground, therefore, more resistance. On flatter surfaces, it may be more difficult to pick up some extra steam. What type of surface will you be mostly riding on? If you’re going to be riding really rocky and unpredictable ground, you’ll want to be equipped with mountain bike tires that can stick to the surfaces. Going over rocks, especially wet ones can cause you to slip out and fall. If you are not riding on really rough terrain and you are mostly going cross country riding, tires with less grip and a narrower base will be fine for you. That will allow you to pick up some more speed and stay fluent when going from downhill to uphill sections. The hardness of the rubber on your tire will determine how much grip, durability, and rolling resistance you will experience. A harder tire will be able to roll much easier but will lack extra grip. With softer rubber, you gain comfort and grip, but also gain rolling resistance. The more rigorous your riding style is, the softer you may want your rubber to be. Harder rubber will help you stay at a necessary velocity when you are on a longer-term track. There are exceptions to the rule, however, and what works for one rider may work differently for another. You can get three different types of tires. The clincher, tubeless, and tubular. Clincher tires use beading on the outside of the rubber in order for the tres to grip onto the trim. They require you to have an inner tube and utilize air pressure to maintain a tight seal. These types of tires are the easiest to replace but also the least durable. Tubeless tires are meant for the more experienced riders. They offer higher puncture resistance and durability. The downside is that they are harder to replace and may take a bit longer. However, they are able to be ridden after a puncture for a short time, so your ride may not have to come to an abrupt end. Tubular tires are a sort of hybrid of both. They still require an innertube but form a tighter seal around it to give the tire a little more strength and resistance to punctures or pinches. There are many forms of mountain bike tires that will get you from point A to point Z. Paying attention to the factors we’ve listed can help you find the best tire for your purposes and have you gleaming while riding down the mountain in no time.